This news item was posted in Pakistani News, Technology category and has 0 Comments so far . – Infinix Mobility, Pakistan is yet again gearing up to launch two exciting smartphones with the name of Smart 2. From the 28th of June to the 3rd of July, Infinix has partnered with Daraz.pk, the largest e-commerce website in Pakistan, for their official pre-booking campaign, after which Daraz.pk is to begin its Mobile Sale Week. On the 4th of July, Daraz.pk will make different models of Infinix handsets available on sale. This will allow its customers to buy the new Smart 2 phones, along with many other Infinix models at a discounted price! Launching on the Daraz.pk Mobile Sale Week, it is predicted that the Smart 2 phones have everything to capture the eyes of digital enthusiasts, social media savvies and the youth of Pakistan. Fitting a plethora of social media interaction right into the palm of one’s hand is what these smartphones intend to provide to their users. Infinix has always been known for their beautiful, elegant phones with intelligent software and a very affordable price tag. This time, they have merged all the unique features from various products into their newest smartphone. The philosophy behind the creation of Smart 2 is to let youth have as much fun as they want with their smart devices without having to look anywhere else. 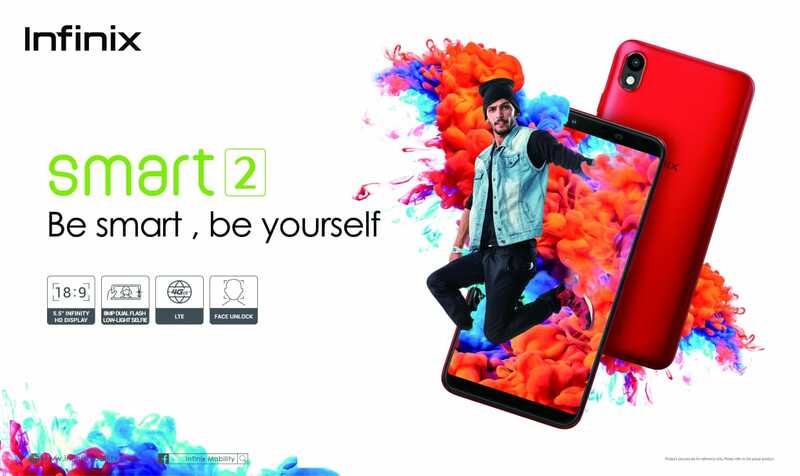 The new Smart 2 would boast a powerful 8MP front camera that comes handy with different photo-editing tools to enhance the selfie experience, thus giving the users greater confidence to expand their presence on social media platforms in a more vibrant way. Another addition in its photography package would be a rear 13 MP camera that offers more high definition imagery. As smartphones screens have turned into an emblem of something much more than just display, companies are working hard on redesigning the screens to create distinctive personas of their brands. The Smart 2 will boast full view display that would let the users enhance their experience by ‘viewing more’; may it be photos, videos or games. The Smart 2 comes in two different models. The first would have high processing speeds, 2 GB RAM and 16 GB of internal storage. The second model will offer 3 GB of RAM to process complex tasks more efficiently, and storage capacity of 32 GB. Batteries are another important aspect of smart devices that are posing a very intricate challenge. By adding more power to the battery and incorporating more safety mechanics, Infinix ensures greater safety along with expanding the standby hours of the smartphones. Both the phones are expected to have a large 3000 mAh battery along with advanced charging technology. Infinix Pakistan has steadily worked in the local market to get its brand recognized. The variety of choices in a single device has certainly attracted a lot of customers to the Infinix brand. Using aggressive pre-booking campaigns and strong collaboration with e-commerce giants like Daraz.pk, Infinix has their targets set high with a lot of new releases in the market, such as the two smartphone sensations Hot 6 Pro and Note 5, and now their latest release: Smart 2. The 2+16 version of the Smart 2 will be priced at only 14,499 PKR, while the 3+32 version will have a price tag of 17,499 PKR, after their respective launch this month. However, through the early pre-booking, the customers can avail a special discount offer! Hurry up! Pre-order your new Infinix #Smart2 exclusively through Daraz Online Store and for the 2+16 version get a discount voucher of Rs.500, and a Rs.700 voucher on the 3+32 versions. It is important to note that the pre-booking time limit is till 3rd of July and the validity date to avail vouchers will be up till 9th of July.